Upaashna is a 12 year old girl. Upaashna is one of 4 children in the family. Her father's income from farming and labouring does not cover the basics for the family and school fees are out of reach. 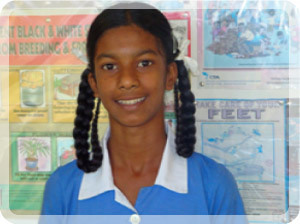 Upaashna enjoys attending school and her favourite school subject is all subjects. When she is not at school she loves to be at home. Upaashna travels to school each day on foot, a distance of 5km each way. When she grows up, Upaashna is "not sure" what she wants to be. Upaashna is a very active child with good study habits. But her efforts are hindered by a lack of [financial] support and resources. I recommend this child for assistance because her father is a labourer and as she moves to higher classes and expenses rise, she may have to drop out. You can ensure that Upaashna receives the education every child deserves.